I first made the England team in, I think, 2002. 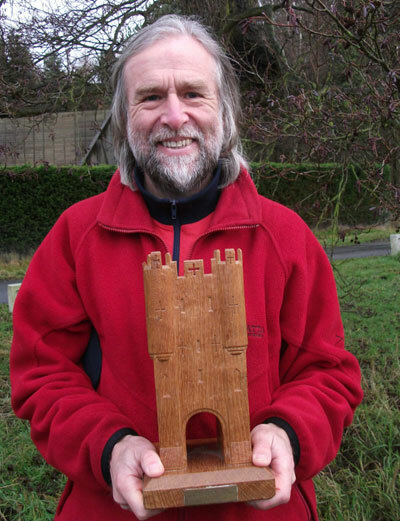 Of course we won the Veteran Home Internationals and I had a look at the unusual trophy – a carving of Micklegate Bar made from a single piece of oak salvaged after a fire in York Minster in the 60s. Now I live less than a mile from Micklegate Bar (one of the gates in the medieval walls of the city) and so I was interested in the history of this trophy. Ten years later, I was given a copy of the programme for “Länderkampf 1971”. This was a joint venture by Eborienteers and York Youth Service and consisted of an international event between teams from England, Norway, Scotland, Wales, the USA, West Germany and Belgium. The trophy was presented by the City of York in 1971 as this was the 1,900th anniversary of the foundation of the city by the Romans. I guess at some point the Länderkampf ceased to exist and England retained the trophy and reallocated it once the Veteran Home Internationals started. The 1971 programme make interesting reading. The first Länderkampf was held in Holland in 1969 and was intended to take place every two years. Competitors were “quartered” at York College of Education. The map was drawn in 5 colours according to international orienteering standards. Friday saw a civic reception by the Lord Mayor. The first event was the following day with first start at 11.01 following a 60 minute coach journey. The same was promised for Sunday and teams departed Monday morning. The last finisher representing the USA took 5 hours 55 minutes 59 seconds. Imagine that happening today – it would keep the Oblogs and twittersphere busy for weeks! After the success of this event, it’s no surprise that EBOR went on to launch the White Rose the following year.